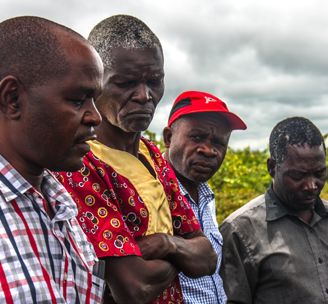 The USAID Tenure and Global Climate Change (TGCC) project in Zambia is a 3.5-year intervention (2014–2018) supporting agroforestry extension services and working to increase customary tenure security at the village and household levels in the Chipata District of Zambia’s Eastern Province. The project supports USAID development objectives of improved resource governance, reduced rural poverty through improved agricultural productivity of smallholders, improved natural resource management, and improved resilience of vulnerable households. USAID is supporting the design and implementation of a rigorous impact evaluation (IE) of the TGCC project intervention in Zambia to explore the relationship between secure customary land tenure and development goals related to climate change adaptation and mitigation. The primary objective of the TGCC IE is to determine whether and how village and household tenure interventions strengthen smallholder tenure security and resource rights and, in turn, lead to increasing farmer investment in sustainable agroforestry and increased adoption of Climate Smart Agriculture (CSA) practices. The IE is a four-arm randomized control trial, designed to assess direct and joint impacts of agroforestry extension and customary tenure strengthening on five outcome families, including: changes in household perceptions of tenure security over smallholdings; land governance and management; household uptake of agroforestry and tree survivorship; changes in planned and actual agricultural investment; and agricultural productivity and livelihood improvements. Prior to the start of program activities, baseline data collection took place in July–August 2014, and endline data collection occurred in July–August 2017, following the completion of TGCC. The evaluation assesses the impact of the TGCC program on household outcomes in 285 communities using four primary sources of baseline and endline data through 3390 household surveys, 285 headperson surveys, 568 key informant interviews, and 62 FGDs. The primary data analysis is supplemented by geospatial data and comprehensive M&E data collected by both the TGCC project and evaluation teams. There is strong quantitative evidence that TGCC has a positive impact on household perceptions of improved tenure security . Households receiving informal customary certificates report approximately a half point increase on a six point index measuring their perceived security of tenure from unauthorized land expropriation. However, there is no evidence that strengthening land tenure motivated increased agroforestry uptake for the household sample, although there is evidence of a link between stronger land rights and other labor and cost intensive field investments. The results show increased rates of agroforestry adoption, although the actual tree planting and seedling survival rates remain low. Vulnerable subgroups may have experienced additional benefits. The study finds several positive tenure and agroforestry adoption impacts for female-headed, youth, elderly, poor and land-constrained households. The analysis found no evidence of a TGCC impact on land governance, crop yields or livelihoods. The evaluation findings support the scale-up of TGCC’s documentation and boundary demarcation approach in Zambia and program piloting, and potential scaling, in other customary land systems in Africa. The benefits of the agroforestry extension should be reexamined and other CSA activities considered, such as minimum tillage or crop rotation, given the large labor investment and challenge to keeping seedlings alive. If the agroforestry extension is continued, future programs should consider strengthening land management rules that would limit seedlings being grazed by cattle or burned by fires, and ensure villages have access to water for the nursery. Introducing incentives for seedling survival or adding monitoring visits might also increase the success of the program.